Frank Bishop has been at war with fallen angels since he was five years old. That's when they first tried to kill him. A group of supernatural warriors called the Watchers saved Frank that fateful day. They taught him how to be a powerful wizard and warrior. But nothing could prepare him for what Jessie and Arraziel have planned. 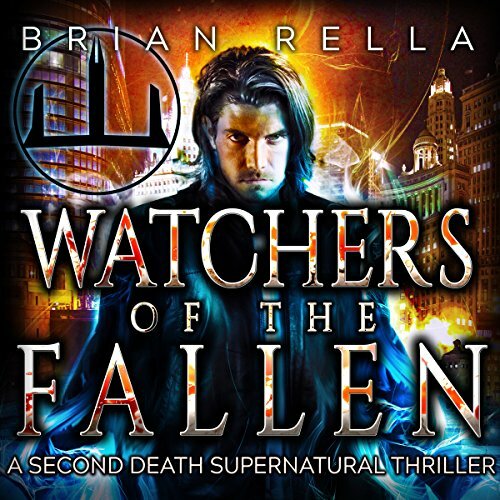 Frank blurs the line between good and evil in his all-consuming quest to stop Jessie and the Fallen in book one of Brian Rella's dark urban fantasy series, The Second Death. You'll love Watchers of the Fallen because everyone loves a hero with a dark side. This book surprised me!! I didn't really know what to expect when I went into it, but I loved it!! The plot was intriguing and exciting. It focuses on Frank, a watcher and Jessie, a girl who had a horrible life and is now in communication with a dangerous demon. It's up to Frank to try to stop Jessie before she unleashes hell on earth. We get to see Frank then and now and learn how he became what he is! We get to see what happens when a frightened and abused 14 year old is brought to the brink and is now in control of more power than she knows what to do with!! I loved Frank. He seems to be a gruff and cranky old man, but we get to see the real him! He is hardworking, loyal, brave and an all round awesome dude! Meanwhile, Jessie's story broke my heart. She is abused and broken and finds a way to get back at those who hurt her. Unfortunately, it's an incredibly evil demon who is intent on escaping the prison he was captured in. In all, this was an interesting Angel vs Demon kind of book. It was awesome to get the back story on the Watchers and even how the demons came to be. The ending leaves me wanting to read the next one as soon as possible and I'm glad I already have it loaded and waiting!! Todd Menesses was good, not great, but good! He had a good few tones and voices and his cadences were great, I just found his voice for Jessie too.....false. It grated on my nerves and was hard to listen to. His voice for Frank was great though. This is book one and does a fantastic job of introducing the characters and laying the groundwork for the series. It takes a bit to get used to switching back and forth between characters and past and present Frank telling the story but once you get used to it the story is fast paced and very enjoyable. The narrator does a great job bringing the story and characters to life. I look forward to more in this series and from this author. The Second Death Series starts off with a bang. As the story develops and the characters begin to do battle, you realize that the mythology behind the story is rich and vast. Very well thought out. The story has a very nice flow and is easy to imagine you are watching a film. The characters are well developed and the creatures are monstrous. Not for the faint of heart. Todd Menesses did an excellent job as always. He breathes life into the characters. GREAT START TO SERIES! EXCELLENT BOOK! I really liked this one, good stuff! Exciting from beginning to end, great plot, awesome characters/development. I love the genre, and it was GRIPPING! Excellent story and excellent narration, Frank and Jessie are great characters. I'm definitely excited to read/listen to more in the series! Cat and mouse game to catch Jessie. Our protagonist Frank Bishop is a Watcher. If you read the prequel you’ll remember Frank as a talented young boy accepted by the Watchers who had just saved his family from the creatures sent to kill them. Jumping forward, Frank is now a young man; an experienced Watcher who has been given the task of finding Jessie and retrieving the book of Araziel. There are other Watchers on Jessie’s trail, but she is protected by the overlord Nalsuu and manages to elude them. Jessie has managed to free another Fallen and she is being guided to a third who will raise an army for the overlord. Will Frank be able to catch and stop Jessie before ultimately releasing Nalsuu himself? Stay tuned to this thrilling adventure to find out. This audiobook was given by the author, narrator, or publisher at no cost in exchange for an unbiased review via Audiobook Boom. I took a bit to get used to the format of the book. Not sure I liked all the jumping around. I did enjoy the story but it’s harder to get into than I’d hoped. Was a tad slow at times. Ultimately it was ok and I may continue the series if the mood strikes but it’s definitely not on my must read list. I enjoyed the way this series started. The story was pretty original and the action was nice. I had the impression that this was in the horror genre, it is not horror. I would consider this modern fantasy or action/adventure maybe. The narration left something to be desired for me, but it didn't detract too much from the overall experience of this novel for me. I was left looking forward to the second book. So, this book was...good, for the most part. It starts a little slow as you get to know the characters and the world is built by the author. I think this part could have been a little faster paced, but it wasn't end of world for me. Once the action truly gets started, though, it's much more exciting and entertaining. The narration is a little dry, but fairly good. Definitely not as good as Luke Daniels, Joe Hempel, and Jeff Hays, but FAR from the worst I've ever heard. All in all, if you like urban fantasy, you should check this one out. I'm going to listen to book 2. Without giving too much away, I really liked this story and I've already downloaded the second book because I can't wait to see where the story goes. Thought the narration was well done and kept me engaged in the story. I've never read or listened to anything by Brian Rella before but this was a great introduction. Hopefully, we will be hearing more from him soon. I'm not sure if I should have gotten the short prequel first but joining at this point didn't leave me lost in the story it was easy to follow. If you like urban fantasy and magic give this one a try. Worth the credit.